The concept of making a seamless 360 degree panorama is quite simple. Stand in one place and take overlapping images as you rotate in a full circle. Then, using Photoshop or other specialized stitching software, combine the images seamlessly into one image. It is possible to make the component exposures for a panorama by standing in one place and rotating, taking overlapping images. This quick and inexpensive method is easy but will lead to difficulty when the images are stitched into the final panorama. If you are serious about making panoramas you might want to consider purchasing a specialized panorama tripod head like the one at left. This is a Bogen 3415 Panorama Head and QTVR System. It has 3 components that when used properly make creating images to be stitched into panoramas practically foolproof. The bottom section is a leveling device with built in spirit level. It is very important that the camera is level or the series of exposures, when stitched together, will move up and down ("keystoning" see below). The middle section is the rotating head. It has numerous settings to allow specific angles of rotation between images. It is best to use the widest angle lens available and using trial and error, determine what angle of rotation allows about a 20 % overlap between adjacent images. It is important that adjacent images overlap somewhat and the greater the overlap the more precisely the images will align. The upper section is a specialized centering mount critical to panoramas. 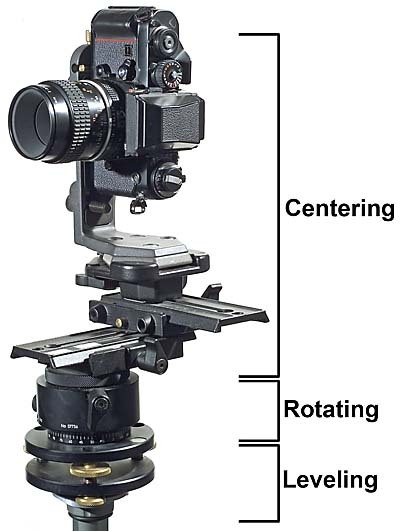 A normal tripod head will place the center of rotation at or near the plane of the CCD chip (or film plane). To prevent parallax problems (near and far objects changing relative postion between adjacent exposures) and the resultant stitching difficulties, the axis of rotation should be centered on the lens. The centering mount allows you to set and lock this position for different camera and lens combinations. This mount also attaches the camera in a vertical position, allowing more vertical coverage. Keystoning is the result of a misleveled tripod head. The this image exhibits severe keystoning due to being made without a tripod. If the image were to be cropped, only the very middle would remain, leaving a pretty dull picture. If the lens is not properly centered over the axis of rotation of the tripod head, parallax problems will occur. This will result in a misalignment of near and far objects as in the image below. The near bar (red arrows) should be continuous but in order to stitch the background properly, it had to be made discontiuous. When making exposures for a panorama, there are some important factors to consider. Set camera to manual exposure. Determine what is the most important area of the panorama and set the camera to expose this area properly. Use this exposure setting for all the images. By doing this, it should mean that all the exposures will match during the stitching process. If parts of the final image are under or over exposed, this can be dealt with in Photoshop later. Set the cameras White Balance to match the light source, not Auto. If left on Auto, slight color changes may occur between adjacent images, causing difficulty in stitching. At some point in the rotation, the camera will be facing into the sun. Be sure to put a lens shade on the lens. Alternately, place the camera in a shaded spot, make the exposures when the sun is highest in the sky and not in any of the images, or wait for an overcast day (not long in Ithaca). You can usually leave Autofocus on but be prepared to switch to manual focus if a foreground object you wish to be in focus doesn't fall in the Autofocus sensing area. In Photoshop, set up an Action to rotate the images and make any exposure and color balance changes you wish to make. I generally try not to make excessive exposure adjustments until the panorama is stitched but some minor tweaking may be helpful at this stage. Move the second image over the first until they are roughly aligned. 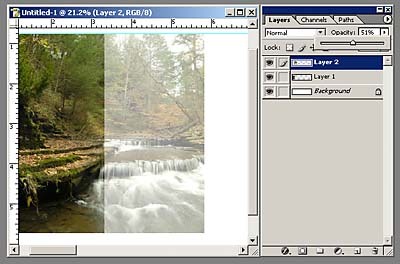 Make sure the Layers palette is open on the desktop (Window/Layers) and have a look at it. You'll see that the image is now composed of 3 layers, the original blank canvas (Background) and the 2 added images (Layers 1 and 2). To make changes to any layer, independent of the other layers, just click on that layer in the Layers palette. Right now Layer 2 is selected. 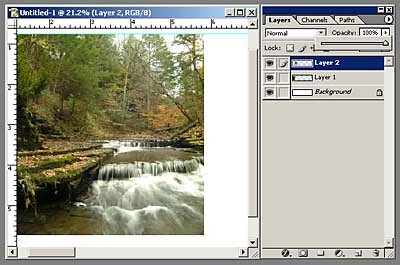 With Layer 2 selected, change its opacity, in the upper right hand corner of the Layers palette, to about 50%. This will allow you to partially see through Layer 2 to Layer 1. Use the Move tool to obtain the best alignment and then change the opacity back to 100%. Notice now that the 2 images aren't completely aligned. You will see (hard to see here but will be noticeable on your computer) that the straight edge of Layer 2 creates a visible seam where the 2 pictures overlap. To smooth this seam out, we'll create a Layer Mask to merge the 2 layers. Click on the Layer Mask symbol (red arrow) at the bottom of the Layers palette. This will create a Layer Mask on Layer 2 (blue arrow). To use Layer Masks properly, you must realize that there are 2 objects on Layer 2 now. To make changes to the image (Levels, Curves, etc.) click on the left hand box and to work on the Layer Mask click on the right hand box in Layer 2. 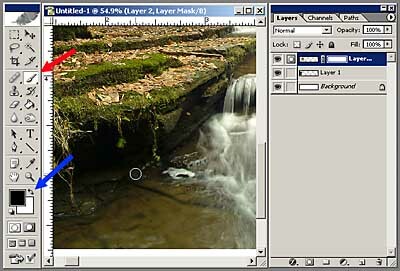 With the Layer Mask in Layer 2 selected, click on the Paintbrush tool (red arrow) and make black the foreground color (blue arrow). Select an appropriate brush size (I usually use a large fuzzy edged brush). Wherever you paint on the Layer Mask with black, the layer will become transparent and you will see through to the layer below. By painting over the hard edged seam, the seam will become diffuse and the 2 layers will blend into one another. To make parts of the Layer Mask opaque again, switch the foreground color to white and paint. At this point the image actually covers more than 360 degrees. Because image 1 and image 10 at the opposite ends overlapped, there is some redundancy. This doesn't make any difference in the print, but if this panorama were to be made into a Quick Time rotating movie, the redundancy would be apparent. Determine where the overlap occurs and crop the panorama (below-red arrow). There are several commercially available programs for stitching panoramas. I use PTGui and find it offers many fantastic features for creating panoramas from a variety of different lenses as well as the ability to create spherical panoramas that include 360 degrees horizontal and 180 degrees vertical coverage. 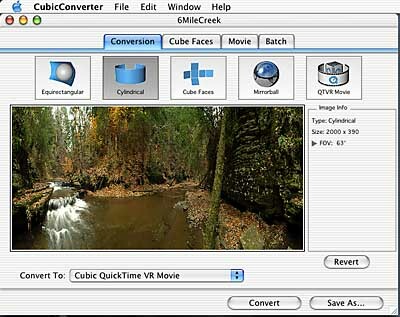 To make an interactive Quick Time rotating movie for the web I use a program called Cubic Converter. This program is very easy to use and will create both cylindrical movies from regular panoramas and equirectangular movies from sherical panoramas. Examples of these movies can be found on the Panorama page. To create a Quick Time movie I first change the size of the panorama to 2000 pixels horizontally, sharpen, and save as a JPEG. Drag the file into Cubic Converter and the dialog box will look something like this. Press the Convert button and it will start making the movie.